If you'd like to use text message participation during one of your events, here's what you need to know. Which number do participants need to send a text message to to answer questions? The number to which answers must be sent depends on the country you have selected in your account settings. You can display that number by starting the "How to participate?" question, or by clicking the i button when displaying a question. You can change the number to a different country's in your Account settings. We currently have a phone number for the following countries: Australia, Belgium, Canada, France, the UK, Spain, Switzerland, and the USA. Note that the text messages will be sent at the normal rate with no additional charges. The American/Canadian numbers are toll-free, even without a phone contract. If you'd like to use text message participation in another country, get in touch with the team! Text message answers to a particular question must be sent in the corresponding format. For example, answers to an open question and a poll won't have the same format. Every time you ask the audience a question, you can display the corresponding format by clicking the i button in the bottom right corner of the screen (or by clicking your keyboard's "Up" arrow). The second step of the SMS participation details the format the answer must respect. You can remove these explanations by clicking Close in the top right corner, or by using your keyboard's "down" arrow. Will participants receive unwanted text messages? 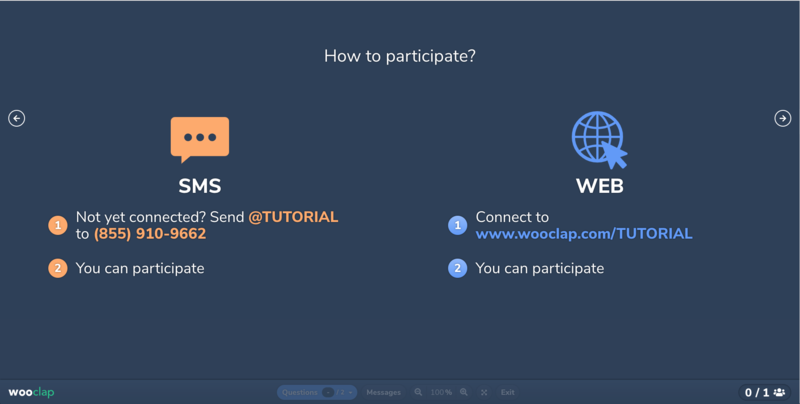 No, the audience will not receive any kind of spam or unsolicited texts after voting on Wooclap. The participants’ phone numbers will never be shared with speakers or third parties of any kind. Note that text message participants won't receive a text confirming they are connected either. 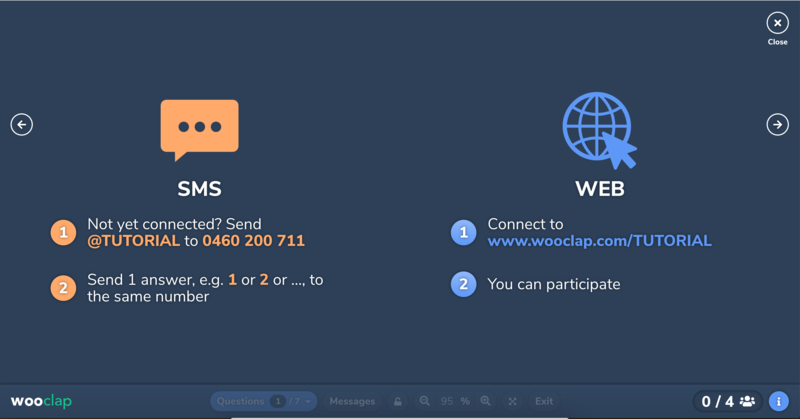 I want to use Wooclap via text message several times in a single day. Do I need to reconnect every time? If you're participating to the same event, you only need to connect to it once, and you will be connected to the event until it is reset or until you connect to another event. If you're participating to different events, you do need to connect to the new event every time.